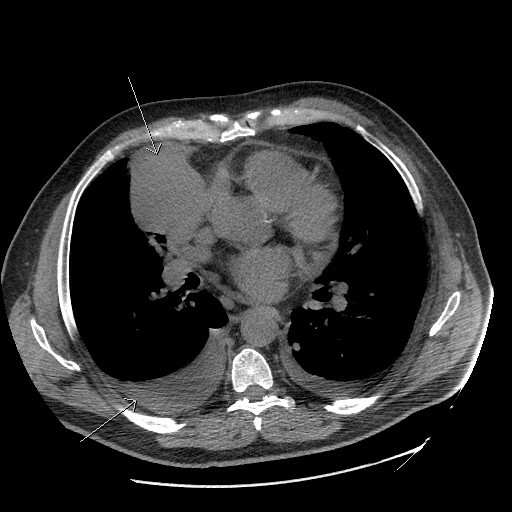 History: 55 year old male with left flank mass on physical exam. 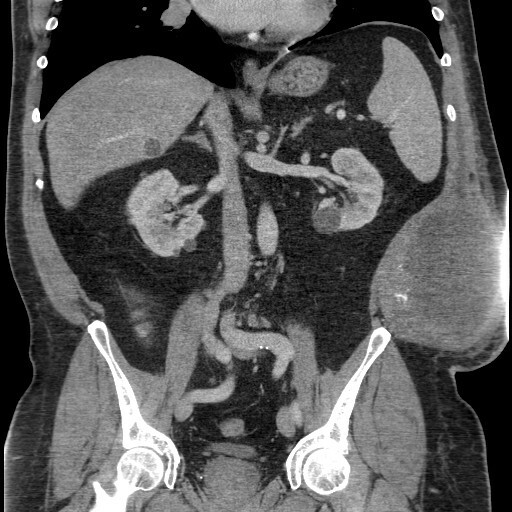 Coronal contrast enhanced CT scan of the abdomen and pelvis shows a large mass arising from the left lower abdominal wall with cystic and solid components, including foci of calcifications. A nodule is also seen in the right lung. Axial CT scan of the chest without contrast in the same patient one year later after resection of the left flank mass reveals the mass in the right lung has markedly enlarged and abuts the right side of the heart. A moderate right and small left pleural effusion are also seen. The diagnosis in this case was metastatic extraskeletal osteosarcoma, which is a malignant mesenchymal soft tissue tumor that contains components of cartilage, bone, and osteoid. Unfortunately, these tumors have a poor prognosis, with an approximately 25% 5 year survival rate. Notice the pleural effusions in the patient above, which may be malignant effusions. Extraskeletal osteosarcomas may be associated with prior trauma or radiotherapy.